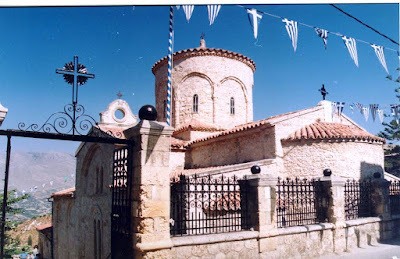 From the courtyard of the church, descending the slope from the western part, there is a small cave in the rocks, which goes beneath the church. It was in this cave that St. Myron lived as an ascetic, and it is connected with a legendary miracle of St. Myron that associates him with a dragon. One day, according to folk tradition, a dragon came to the village from the north side, frightening the residents. 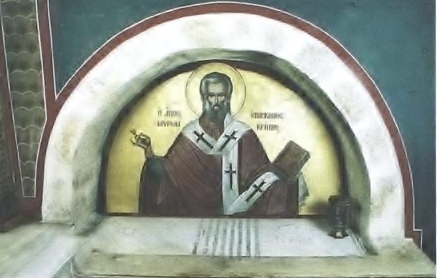 St. Myron was being elevated to his episcopal throne at the time, therefore he was absent from the village. Another time when he was there, the dragon came again, but it took place on a Sunday morning while he was celebrating the Divine Liturgy in the Church of the Savior Christ, which still stands today. When the Saint heard the news, he calmed the people and sent his deacon along with his episcopal staff to order the beast to stay still in the name of Christ. Indeed, the dragon stood their motionless and dead. Then when the Divine Liturgy was over, the Saint stood in the courtyard and threw a large stone at the dragon. Stones then began to rain down on the dragon, fossilizing him in a big rock. This rock still survives and is called "Drakos", which is Greek for dragon. 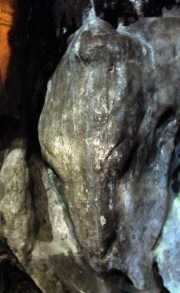 Today you can see the petrified tail of the dragon in the northwestern part of the village and the petrified head in the southwest in the cave, where a holy spring gushes forth. In the cave one must descend three steps to reach the holy spring, which is in the middle of three potholes. 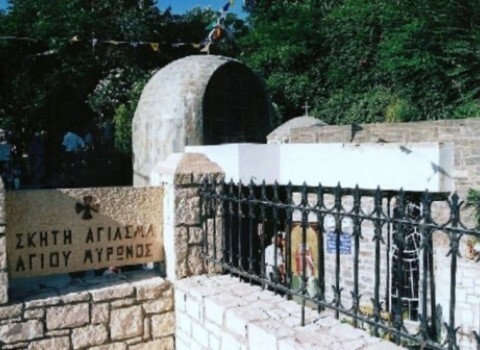 There can also be found the bed of the Saint in the cave, together with an icon of the Saint with an oil lamp that always remains burning. It should be noted that the rock known as "Drakos" is a barometer of nature. It is a curious phenomenon from ancient times. 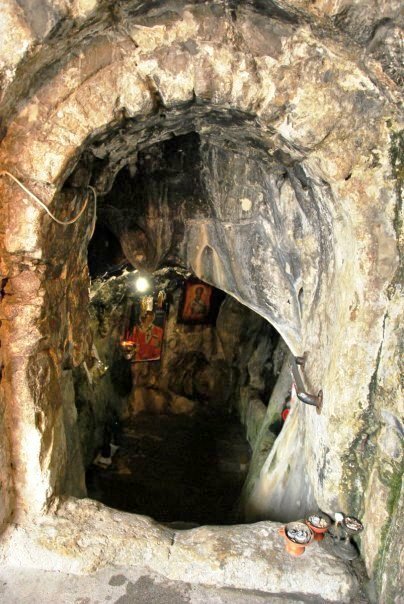 The rock of the cave is made of granite and has an area of ​​about 1000sqm, and it is an infallible predictor of the weather. Sometimes small bubbles as a white foam come out of its slot, an indication it's going to rain according to residents, and sometimes it makes a strange noise in the rock, an indication that it will be a heavy winter. This is confirmed by many villagers, who have witnessed this phenomenon. Many foreigners, geologists and engineers have visited the Drakos but have so far failed to explain this particular phenomenon that is an original barometer of nature.